The aim of the education is to understand, train and work with board leadership. The education focuses on how to apply your personality, your resources, and your leader skills, to make sure that the board can cooperate and create results. CHAIRPERSON™ is a board education, which evolves you as a board leader. The main focus is to treat board work as working with real life people. The board should focus on developing the company and applying the available resources both in the board and in the executive committee. This requires documented board leadership, which sets demands for personal leadership, resources, competencies, qualifications and a clear leadership identity. 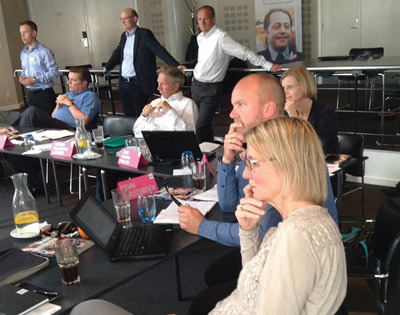 Order now and participate in Denmark’s only board education for board leaders. Throughout the whole education, you will receive a lot of tools to use in future board work. 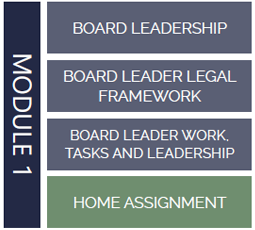 You will be acquainted with the work model BOARD GROUND ZERO™, and get a whole new insight in the requirements of working as a board leader. 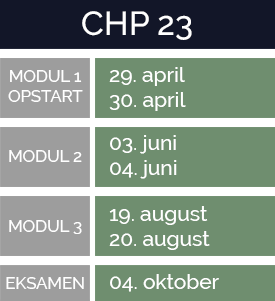 The board education consists of 3 modules of a 2-day duration. 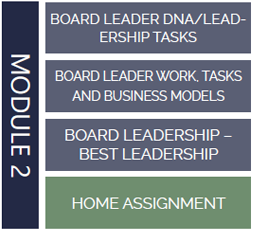 Between the modules you will work with the development of your personal board leader book. This written exam will take book will revolve about this book. 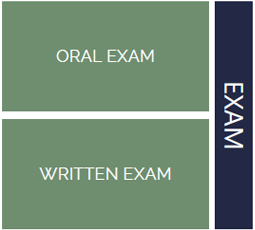 All exams will be evaluated of an external censor, both in the oral and written exam. CHAIRPERSON™ is relevant for you who wants to develop your leadership skills, thus increasing your ability to lead a board. The board education is directed towards current and upcoming board leaders. It is also for you who have experienced the challenges of getting the board to function together and work towards the same goal. You will be trained in how to communicate concrete board tasks, and how to make sure that the board works towards the same goal. You will learn how to get the optimal performance out of every board member, and how to boost their resources from a meeting participant to an active board member. You will be presented some of the newest development methods concerning modern leader-oriented board work. These methods will enhance your decision-making skills, and courage to develop the board. 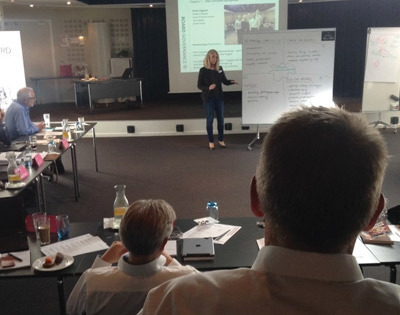 CHAIRPERSON™ is based on our cooperation with leading researchers in board work, and several of the best practitioners in Denmark regarding board management. Due to this, we know what has an effect on your function as a board leader. Being able to master the function as a board leader and getting documentation on your capability, will assist you in creating a brand for yourself as a board leader. Board management sets other requirements for work forms, management, and application of personal resources, compared to other types of leadership work. You will be presented to some of the newest development methods related to modern leadership and business-oriented board work. This includes how to work with the BOARD GROUND ZERO™-model, and how to create documented results. The CHAIRPERSON™ education makes use of virtual boards, which promotes learning new methods and tools. 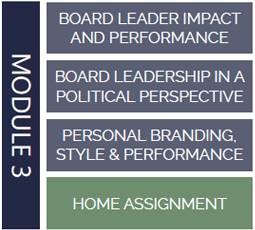 The majority of the participants on CHAIRPERSON™ seeks to strengthen their current board resume, either through new board tasks, or by creating more value in the current board leader job. 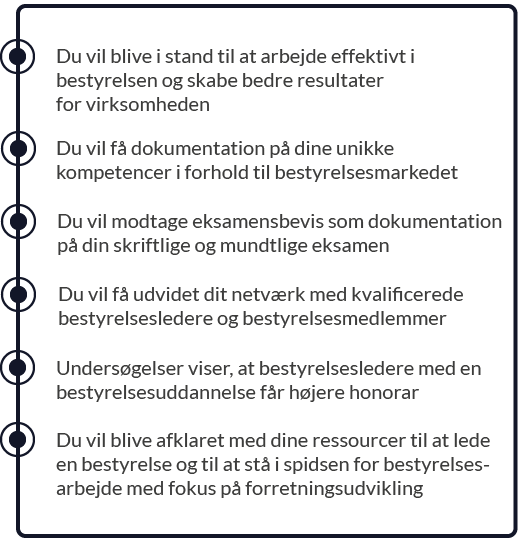 With an exam from CHAIRPERSON™, you will also be able to obtain a BESTYRELSESLEDERLICENS® to get further documentation upon your abilities as a board leader. This will furthermore qualify you to apply in our prestigious KANDIDATBANK.